Most of my posts contain affiliate links where I get a small percentage of the sale at no additional cost to you when you purchase something through a link. Thank you for starting your shopping here at Books, Bargains, Blessings. I received a free copy of this book from Family Christian in order to do a fair and honest review. I also received an appreciation certificate for hosting the giveaway. 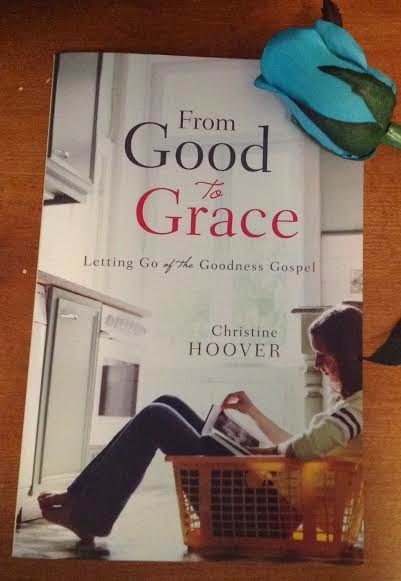 From Good to Grace: Letting Go of the Goodness Gospel appealed to me. I was the classic good girl in high school and college. In fact, I once made a checklist of all the "Good Christian Things" I could think of and would see how good of a Christian I was each week. Going to Sunday School? That got a point. Memorizing a Book of the Bible? Another point. Choir Practice? It was on there, too, even though I can't sing at all. I lost points if I didn't write a missionary, pray through my entire prayer list, and another 27 other things that would tell me at the end of the week if I passed or failed at being a Christian. Needless to say I never was able to live up to my expectations, and I failed. I was hoping to love this book. I wanted to rave about how wonderful it was. Yet, I can only say it was good. There were two chapters that stood out as excellent (Receiving His Freedom and Love Shows). This book is good, but I think I have been a bit too well read on grace over the years for this to be something outstanding to me. Still, I would highly recommend it for a women's Sunday School class, Bible study or book club. My boyfriend tells me I am intense about my faith, and because of that and being the voracious reader I am, I have read countless books on this topic. Yet, it was still a good reminder that being good doesn't equal grace. It is rare that I agree with everything in a book, and the one problem I had with this one was where she told someone, "I know exactly how you feel." Because each person is different, they will view each situation uniquely. I've always felt that a more loving way to say basically the same thing is say, "I have felt. . ." and then say how you interpret the person is feeling. I did like that this is nearly a Bible study book but the author uses many personal examples of how she has given or received grace. She's married to a pastor, a church planter, no less, and has an autistic son. I would say she has a lot of experience giving and receiving grace. She also dispels the myth that if we are good enough, we will be blessed by God. That was a very popular teaching among my friends for a long time. I no longer buy into it. Life happens. Accidents happen. If being good meant a perfect and prosperous life, then the Pharisees (either ancient or modern day) wouldn't have a care in the world. This book helps remind us of the truth of what good doesn't accomplish and what grace does. From now until March 31 Family Christian is having a special sale, 25% off your entire online purchase of regularly priced items. Just use coupon code MARCH25. This is the perfect time to purchase this book or another item that Family Christian sells. I would buy a book, but I'm not sure which one yet. I might get some Christian music for my kids, or there's some Biblical archeolgy books I'm interested in there. I would buy the 'Dear Dad: A Keepsake of Blessings and Memories of Growing Up with You' from Family Christian with the appreciation certificate if you won. Probably a Mandisa cd..love her. A bible might be nice and or some jewelry they have. I would get a new bible for my son, as his is wearing out. I would like to get a new Bible. I love the Maude Asbury Geofabulous Collection - Pocket-Size Notebook. So pretty! kristiedonelson(at)gmail(dot)com Thank you.